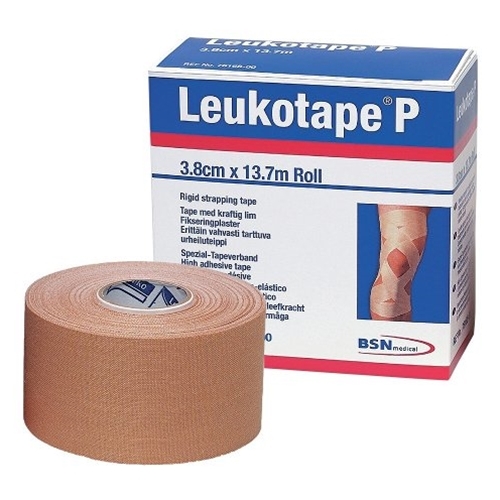 Leukotape P Sports Tape from HealthyKin.com is a high strength, rigid strapping tape, with a very strong, zinc oxide adhesive. It is porous and hand-tearable, yet offers extra strong support for sprains and strains. Ideal for patellofemoral taping. Use in conjunction with Cover Roll Adhesive Bandage. This is the best tape I've ever used for blisters on wildlfire assignments. One application lasts for several days without tearing or rolling at the edges. Use this to tape kneecap ( with a cover roll tape) as physical therapist recommended. Allows me an active lifestyle again. Best Physical Therapy tape out there. This tape has saved my husband! ! Our physical therapist suggested him using it for his foot. Thank you for having it in stock! They get the product out to you fast. I love this product for all my clients with foot pain. I've tried other tapes and none holds, stretches, or wears like this! Ordering more now!